The Barnes & Nobles signing well take place on Thursday, 5/15 at 6pm. But here's the important part. They're going to pass out wristbands at 2pm that day. You can only get your book signed if you have a wristband. So go EARLY! Also, like usual, he will only be signing copies of the book - the sign says no sports memorabilia. Click (here) for more info from B&N. The 2nd event is going to be on Sunday 5/18 and is being held at The Estate. According to the flyer on their website, there's a VIP Party from 7-8pm (tickets are $100) which includes a signed book and then general admission to the launch party is from 8pm to midnight (tickets are $40). The fine print for the general admission says that it includes a book - but it doesn't mention if you'll be able to get it signed or not. Click (here) to buy tickets to the Estate launch party. 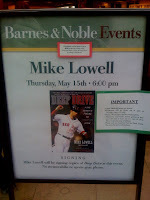 1 Response to "Mike Lowell Book Signings - 5/15 & 5/18"
Thanks a bunch for posting that. I would have never have known they were giving out wrist bands. I am going tomorrow WICKED early.